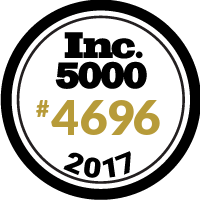 For the eighth consecutive year, Inc. magazine has ranked eMazzanti Technologies among the top fastest growing private companies in America in its annual Inc. 5000 list. President and Co-founder, Carl Mazzanti attributes the achievement to strong growth in cloud services and the retail and legal technology segments. The acquisition of an award-winning digital marketing agency, Liqui-Site, also contributed to revenue growth. eMazzanti Technologies ranks number 4,696 on the 2017 list, one of only three IT services companies in New Jersey to make the list eight times or more. The Hoboken, NJ IT consultant, MSP and cloud services company is also ranked 51st among such companies nationally. In making the list eight consecutive years, eMazzanti also earned the Inc. 5000 Honor Roll designation. “Fewer than a tenth of Inc. 5000 honorees - an already quite select group - ever achieve this milestone,” stated Schurenberg. Addressing the cloud computing needs of geographically disbursed customers, eMazzanti’s expanded cloud services offerings continue to attract market attention. The offerings include Azure-based infrastructure as a service (IaaS), disaster recovery as a service (DRaaS) and support for SMB and enterprise customers through a cloud MSP business model. The addition of industry-specific technology offerings in recent years has also strengthened eMazzanti’s presence in the retailer and legal technology market segments. Furthermore, the acquisition in 2016 of Liqui-site, an award-winning digital marketing agency provides a logical extension of IT services to the entire eMazzanti customer base. eMazzanti’s cloud services provide extended capabilities, agility and increased efficiency to its customers. Industry-focused solutions such as POS systems and infrastructure, PCI compliance and retail payment technologies have transformed eMazzanti into a one-stop technology shop for retailers. In addition to making the Inc. 5000 list for the eighth consecutive year, eMazzanti was recently named a 2016 New Jersey Business of the Year and has been recognized by prestigious industry publications. CRN named eMazzanti Technologies to its 2017 Managed Service Provider (MSP) 500 list in the Pioneer 250 category. And, the company ranked 140th on the 2017 MSPmentor 501 Global Edition, an annual ranking of the world's top 501 managed services providers. In addition, Carl Mazzanti, was named a finalist for the EY Entrepreneur Of The Year® 2017 Award in the New Jersey Region while eMazzanti was ranked 11th (1st in the retail category) on After Nines Inc.’s ChannelE2E Top 100 Vertical Market MSPs list. Companies making the list are ranked according to the percentage growth of their annual revenue over a three-year period using 2013 as a base year. To qualify, companies must have been founded and generating revenue by March 31, 2013. Only U.S.-based, for profit, privately held independent companies, as of December 31, 2016, were eligible for consideration. Firms must also show 2013 revenues of at least $100,000 and 2016 revenues of $2 million or more.